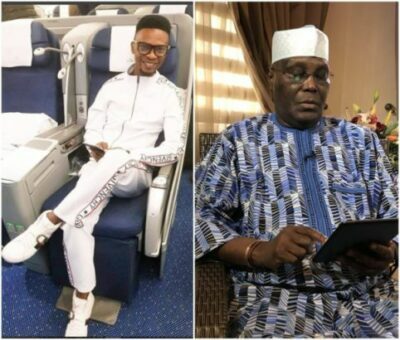 Earlier in the week, comedian I Go Dye wrote an open letter to 2019 Presidential aspirant, Atiku Abubakar telling him not ‘to use sentimental empathy on the youths to express his political ambitions’. Recall that when Atiku resigned form APC two weeks ago, he mentioned that the APC had forgotten about the Nigerian youths. Atiku Abubakar has now replied him and he did it via another social media tool called ‘Medium’ to show he is tech savvy and young at heart. Firstly, you are right. The Nigerian youth have often been taken for granted, and almost every leader in our history has taken young people for granted. But it’s important to point how this started — for people like me who saw Independence; our leadership was mostly driven by young people. Then came the coups, and the civil war, and then more coups. Nigeria ended up with a long period of military dictatorship for many decades, in which time; those young leaders aged, but still remained leaders. Fela, Gani, Enahoro, and Beko were young leaders, yet remained leaders until their demise. That was because of the instability brought on by decades of instability. I do understand your frustration on the issue, however. I tell people my age that to understand young Nigerians, we need to understand the difference between Nigerian and Naija. Naija embodies the hopes and dreams of young Nigerians, the country they love and long to go home to when they are abroad. Naija is the country that brings them pride in music, film, comedy, fashion, and technology. It is the country of Wiz Kid, Asa, David O, Tuface, the Olympic bobsled team, Iwobi and Don Jazzy Again. Honestly, I did not ever think we would be that successful, which was why I kept my day job, when we started it. It was just what you would call, a side hustle, but it grew so big, and I had to quit my government job to focus on it. Today, every oil major uses the facilities we built. The government only became clients after the oil companies. Our company has expanded to several countries in Africa. Even the FG has seen that that company is the most competent logistics company in Africa, which is why it gives Intels the most complex operations to manage. The success of young Nigerian entrepreneurs in IT & technology, retail, music, and arts shows that given the chance, they can run anything. My job is to be a bridge, which supports our young people achieve these ideals. I will never say only I can do this. I can’t do it alone. I need your support, I Go Dye, so help our economy grow, to ensure that within 10 years, our young people can take over completely.